I've been watching Cassini's raw images website for the latest eye candy from Saturn's equinox. Here is a particularly nice view of a crescent Saturn with dark rings, just a week after equinox. I love the skinny shadow cast by the vast ring system, and the way the rings are brightened by reflected Saturnshine. 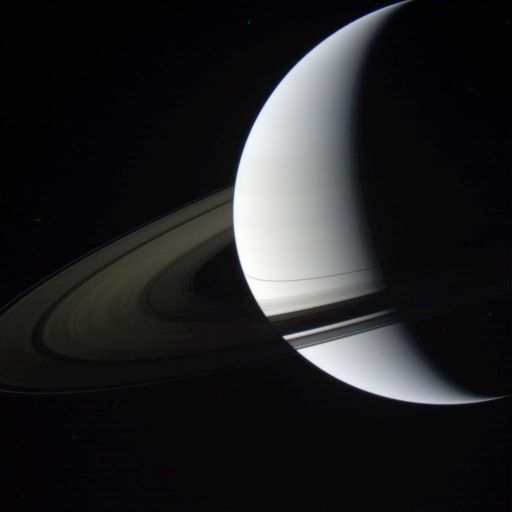 The image is composed of red, green, and blue frames so has some relationship natural color, but because Saturn is so much brighter than the rings the color doesn't work particularly well. Cassini captured this image of a crescent Saturn with a barely lit ring system on August 19, 2009, about a week after its equinox. The rings cast a skinny linear shadow along Saturn's equator. This image contains numerous artifacts because it was composed of frames from the raw images website. 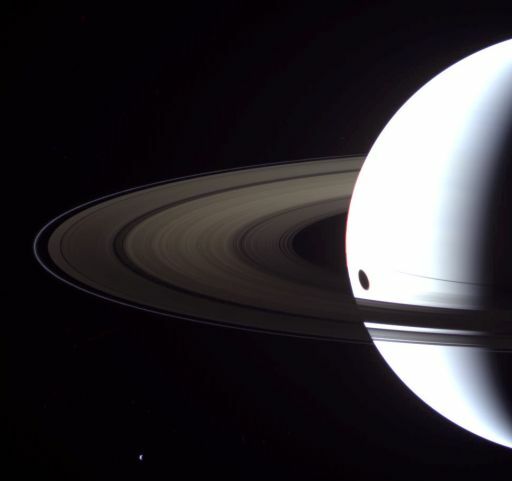 This set of images is even cooler, but overexposure of Saturn makes the color even more difficult. Still, it was well worth fiddling with because of the great fat shadow cast by Titan on the planet. Now that we're after equinox, Titan's shadow is falling to the south of the rings' shadow. To top things off, there's a skinny little crescent Tethys at the bottom left of the image. This one is also composed of red, green, and blue frames. Because everything in the Saturn system -- Titan shadow, Tethys, and Cassini -- was moving in the time separating the frames, when I matched up the three frames of Saturn and its rings, the Titan shadow and Tethys were misregistered; so I fudged things by cutting and shifting shadow and Tethys until they were aligned. Enjoy! On August 19, 2009 Cassini caught the shadow of one moon, Titan, being cast on Saturn's disk. Below the rings, a small crescent Tethys is visible. The rings cast a nearly invisible shadow on Saturn's disk; Saturn itself is overexposed in this view. Prometheus and Pandora are within the field of view, along the outermost F ring, but are too small and dim to be readily visible. This color composite contains numerous artifacts because it was composed of images taken from Cassini's raw images website.